The Punjab Police has cracked down on yet another Delhi-based multi-crore international synthetic drug racket with the arrest of five Delhi and HP-based persons. The unveiling of this Delhi-based international drug racket follows close on the heels of neutralizing of the Delhi-based racket controlled by kingpin Dev Behl.Disclosing this here today, Mr. Dinkar Gupta, Additional DGP/ Law & Order said that this important and major break-through in the drive against drug trafficking follows systematic and meticulous investigations by the Punjab Police with the objective of exposure of drug networks in a complete and end-to-end manner from source of supply to the distribution network. He informed that the Punjab Police had started a two-tier interrogation of drug smugglers from October 14 onwards, with the smugglers being questioned firstly by the district police, followed by sustained interrogation by officials of the State Special Operations Cell (SSOC) in the Joint Interrogation Center at Amritsar. So far, over 100 smugglers have been interrogated. These interrogations have yielded valuable information about the various cogs in the different drug networks so as to enable the Punjab Police to smash these drug networks in an end-to-end manner, from source of supply to the distribution network. He said that the focus was not limited to the State of Punjab. Networks operating in other parts of the country were also being detected and action being taken. This racket was the second successive Delhi-based synthetic drug racket busted in a short time by the Punjab Police, he added. Gupta revealed that investigations into the Delhi-based multi-crore synthetic drug racket have revealed a new trafficking route being used for pumping synthetic drugs into North America through Myanmar and China utilizing Golden Triangle-based links. 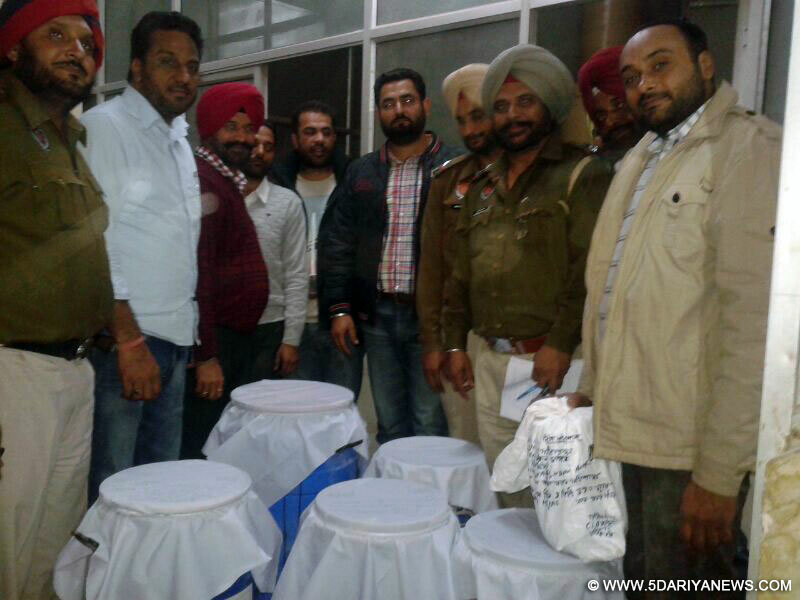 Punjab Police has made five arrests from New Delhi and HP, including that of a Myanmar national and recovered large quantity of precursor chemicals, and drugs worth over Rs. 200 crores in the international market. The arrested persons includes Suresh Kumar @ Mainga r/o Ram Lubhaya – Manager of Gagret- based factory in Himachal Pradesh- arrested from HP on December 7, 2013, Varinder Singh @ Raja s/o Jaswant Singh r/o 98 Vikas Puri, New Delhi- base in Rangoon, Myanmar- arrested from New Delhi on December 8, 2013, Hrang Tin Khara @ Adam Zanniat @ Robert s/o Biakzama r/o H.No. W-2/21, Ground Floor, Badala Vikas Puri, New Delhi- base in Klimou , Myanmar- Myanmar national – arrested from New Delhi on December 10, 2013, Rajesh Kumar Bansal s/o Gora Lal Bansal r/o A-2/73, Sector 3, Rohini, New Delhi- arrested from New Delhi on December 12, 2013and Ajay Jain s/o Amrit Lal r/o 35-C, Hasab Vihar, Sector 9, Rohini, New Delhi- arrested from New Delhi on December 12, 2013. Gupta said that conducting systematic and meticulous investigations, the Punjab Police zeroed onto Suresh Kumar and uncovered a pharmaceutical factory in Himachal Pradesh (HP) being used for manufacture of synthetic drug ICE (M-amphetamine) from precursor chemicals likeephedrine, pseudoephedrine, ketamine etc.. 50 kgs of precursor chemicals worth Rs.50 crores in the international market have been seized from the Gagret factory on the disclosure of arrested factory manager Suresh Kumar.He further said that in consonance with the policy of conducting investigations in an end-to-end manner by exposing drug trafficking rackets from the source of raw materials to the distribution network, the Punjab Police analyzed and dissected all available information on the Delhi-based synthetic drug racket and has uncovered a new drug trafficking route to North America through Myanmar and China, utilizing Golden Triangle links. This is a major breakthrough for Punjab Police. He said that the painstaking investigations and developing and cross-verifying available leads led the Punjab Police to Delhi-based Varinder Singh @ Raja who has been arrested from Delhi on December 8 and was presently under seven day police remand. Varinder Raja’s family, including his father are based in Myanmar and his wife is a US national. He was one of the main recipients of consignments of precursor chemicals like ephedrine and pseudoephedrine from Dev Behl. Raja would supply the precursor chemicals to Myanmar national Hrang Tin Khara @ Adam Zanniat @ Robert who had bases in Mizoram and Delhi as well. Robert further supplied the precursor chemical to factories located on the Myanmar-China border.It was also revealed that Varinder Singh @ Raja was a public school educated person, having studied in Guru Nanak Public School, Mussoorie and Shivalik Public School, Mohali. His wife is a US citizen while his parents are based in Rangoon, Myanmar. Raja was a young person who has become rich quickly- he was in his mid-thirties, likes wearing branded clothes, was into going to discos and parting late at night. He was leading a luxurious lifestyle and has extensively travelled abroad. According to his passport, Raja has visited Myanmar, China, UK and Dubai among other countries. He has an export license for sewing machines. Varinder @ Raja was also multi-lingual and was fluent in Burmese, Mizo, Hindi, Punjabi and English. Besides this, Robert- the Myanmarese national changes his colours, dress etc. often and is difficult to find or pin-down. He has three aliases and bases in Mizoram, New Delhi and Myanmar. He would come to New Delhi at regular intervals for obtaining precursor chemicals and would go back to Myanmar with the contrabands which would then be used for manufacturing synthetic drugs in factories on the Myanmar-China border. Robert had come to New Delhi three months back and was slated to go back to Myanmar with a contraband consignment (precursor chemicals). Mr Gupta informed that the Golden Triangle was one of Asia's two main opium-producing areas. It was an area of around 367,000 square miles (950,000 km2) that overlaps the mountains of three countries of Southeast Asia: Myanmar, Laos andThailand. Along with Afghanistan in the Golden Crescent, it has been one of the most extensive opium-producing areas of Asia and of the world since the 1920s. Most of the world's heroin came from the Golden Triangle until the early 21st century when Afghanistan became the world's largest producer. Myanmar is the world's second largest producer of illicit opium, after Afghanistan and has been a significant cog in the transnational drug trade sinceWorld War II.He further informed that conducting the investigations in the classical end-to-end manner the Punjab Police brought Hrang Tin Khara @ Adam Zanniat @ Robert under its scanner and with the available leads effected his arrest from Delhi on December 8, 2013. Robert has been produced before the competent court which has granted seven days police remand for his custodial interrogation. Further investigations have led to the arrests of two more Delhi-based persons today on December 12, 2013 who were involved in the international synthetic drug racket- Ajay Jain, supplier of precursor chemicals pseudoephedrine and ephedrine, and, Rajesh Kumar Bansal, owner of a factory where precursor chemicals were illegally converted into synthetic drugs like ICE (M-amphetamine). 150 kgs of pseudoephedrine worth Rs. 150 crores in the international market, 7.5 kgs of unlabeled powder and 2.4 kgs of intoxicant drug in powder form have been seized from the factory of Rajesh Kumar Bansal in New Delhi. He pointed out that while checking the records of precursor chemicals in the factory of Rajesh Bansal in New Delhi, it has been found that over 1800 kgs of precursor chemicals have been shown as sold/consumed in only three months of 2012 as against normal yearly consumption of 300-350 kgs. Along with the competent drug authority in the Health Department, verifications were being conducted regarding persion of precursor chemicals and its scale of magnitude.It has also been revealed in investigations that most of the synthetic drugs being smuggled were targeted for the international market in North America and Europe- mainly Canada, the US, Australia etc.. Robert would supply the precursor chemicals to the factories based on the Myanmar-China border which would manufacture synthetic drugs like ICE (M-amphetamine) and using Chinese suppliers, these synthetic drugs would reach the international market. Further investigations are ongoing.